Contemporary independent film, domestic and international, is not readily accessible to the majority of people. It’s not always easy to find, learn about, or watch. Is this problematic, and if so, how do we change it? 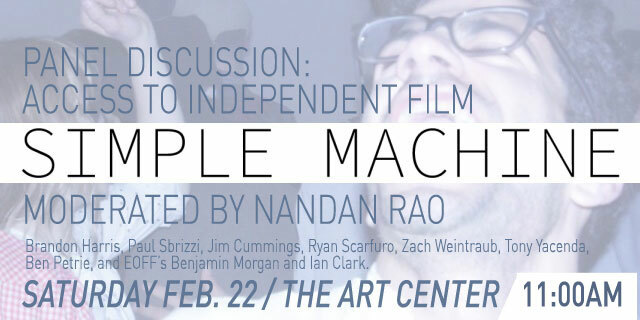 Panel Guests include Nandan Rao (moderator), Brandon Harris, Paul Sbrizzi, Jim Cummings, Ryan Scarfuro, Zach Weintraub, Tony Yacenda, Ben Petrie, and EOFF’s Benjamin Morgan and Ian Clark. Simple Machine is a website dedicated to people showing movies to people.